2009 – the year the physical bookstore lays down and dies? Past studies have shown that an active second hand market helps to boost the sales of new goods, because it makes those goods more valuable to folks who recognize they’ll be able to resell them on the second hand market later. That may not be helpful to physical bookstore retailers, but those retailers have to learn to adjust with the times as well. Obviously, just selling books is going to make less and less sense, but we’ve seen retailers that have worked hard to turn their stores into destinations, where there were good reasons to go and buy stuff, rather than just being a physical version of what you could get online. It’s an interesting response – though I’d point out that it’s exactly that type of “destination” branding that has killed off the UK library service so effectively. But then again, libraries aren’t businesses in the same way as bookstores. Maybe I’m just a cynical conspiracy theorist, but all this sudden scaremongering sounds like groundwork for the introduction of a new law forcing sellers of secondhand books to pay royalties on all sales. Those media conglomerates have got to protect their vast profits somehow, after all. Personally I tend to know a couple decent shops in London that sell books quite cheap ^_^. 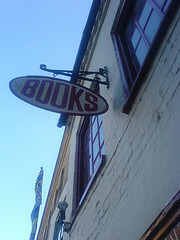 Bookends is one that sells the excess books that mainstream shops can not, often for over half price the retail value. From there Ive manage to pick up large amounts of Alaistair (sorry about the spelling) Reynolds, “The Blade Itself” triology and a great selection of others. Secondhand booksstores are great as are charity shops. However if I become entrenched in a series or it comes highly recommend I will happily pick them up new from a bricks and mortar store. Well, it depends what kinds of books I’m buying. Since I’m in college/university, I have a lot of books to buy every quarter (being a lit major makes it much worse, of course). Generally I get all my school books online via Amazon (and of course I help someone out with an Amazon store in the process). Occasionally I’ll buy a non-school book on there, such as something that is really hard to find elsewhere or if I need a filler book to get free shipping. For everything else I either go to a used book store or I go to Borders or some other new book store. Downtown Santa Cruz has three! Book Shop Santa Cruz, Borders, and Logos (the first and the last being new/used places that have very differing stock). There’s also the Literary Guillotine, which contains mostly school books, but sometimes gets some really interesting books (you’d be surprised what some of the students at UCSC read). So, yeah. I will continue doing it that way until I’m done with school or until book stores actually die. I’ve predicted that physical books will pretty much disappear in their existing form in the next 50 years or so, but who know, the way (Barnes and Noble is closing several stores in my area of Northern CA, USA) businesses are performing nowadays, it may be even sooner. I buy books online most of the time now, but only when I’m looking for something. Nothing can ever beat the days when I lived in Birmingham, going to this store there called Reed Books. It was a somewhat-organized, dusty, musty warren, filled with all kinds of random crap. I could go in there and spend a couple of hours picking through the shelves, and come out with a stack of things I’d never thought about buying. If that sort of thing starts to disappear, I think the next generation’s really going to lose an experience.